Ein sehr gutes Blues-Album. #13 in US Billboard Charts, sein Durchbruch also. 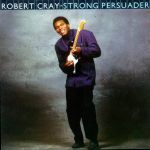 "Smoking Gut", als erfolgreiche Single daraus, erreichte #22 der Billboard Hot 100 und #2 der Mainstream Rock Tracks.<br>Wikipedia schreibt dazu noch:<br>"Cray's music contains sometimes sexual lyrics, which are showcased on Strong Persuader. Some lyrics from "Fantasized", for example: "She had sugar-sweet lips and magical hips just like I fantasized, what a slow ride, she moaned and she cried just like I fantasized." "